It is 7:20 in the morning at Andover High School. Students flood in, returning from their holiday breaks. Mr. Pellerin, an English teacher at AHS, strolls into the school early, as he always has, to prepare himself for his first block Dramatic Literature class. His classroom is a cozy room, dimly lit by shaded lamps resting on living room style end tables. The lighting has always provided an ideal place to communicate with his students and introduce his very interactive way of teaching. The desks are shaped in a U formation, like a stage, allowing all students to see each other. There has always been one unfortunate problem however. Inside of that U-shaped desk formation was a dusty tangled mess of a projector. Cords stretched out of the projector, flowing through the classroom, into the wall. It rested on top of a dusty metal cart, which had a little extension for the computer to sit. Beneath the top shelf of this rolling cart were two old temperamental speakers. Many teachers would not take the effort to move around this cumbersome mess, but for Mr. Pellerin, it was essential to carry out his lesson. He loves to be able to show his students clips from plays, as well as clear and precise notes on the whiteboard. He needs to be able to display student essays on the board and have the class be able to go up and write corrections right on it with dry erase markers. So consequently, everyday Mr. Pellerin would have to roll out that cart to the middle of the desk formation, he would have to shake those dusty unreliable speakers until they worked, and sometimes if he did not want to write on the board, he would hang up a dangerous looking, rickety screen from a nail. On top of this, attaching all of the cords everyday to the computer, the speakers, the projector and the internet was a mini nightmare. “Every time I switched a class, it would be completely unhooked,” said Mr. Pellerin, “and I had to hook the whole thing back up, so it did take up time from my classes.” It became the joke of the class. Pellerin always kidded about how it took him almost ten years to get his window shades, so that it would be only a decade longer before he got some better equipment. He was told by administration that new technology was coming soon, but figured that his soon and their soon were two different things. Little did he know that he would not be waiting quite as long as he expected. Pellerin walks into his class around 7:23, ready for the post-vacation sluggishness that he had come to expect from his students after every break. He put his work bag down by his desk, ready to begin his morning routine, but something is different. The class seems slightly more spacious. He then looks up and sees with great excitement, a white grooved box attached to the ceiling. His room has been installed with a brand new interactive projector. Instantaneously he starts eagerly reading the directions like a young boy on Christmas day. Now he can have an even more interactive class, no cords attached. These new machines are called Epson Brightlinks Projectors. To use them, teachers hook their computers in, and project their screens onto their white boards from the machine installed on the ceiling. 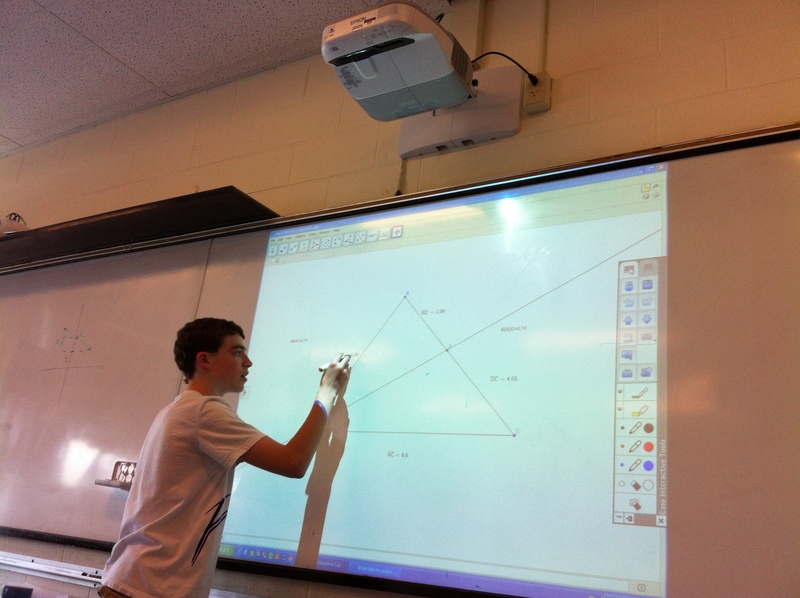 The difference between a normal Epson Projector, and a Brightlink, is interactivity. Almost all of the classrooms have been given this pleasant surprise at some time this school year, causing both excitement and confusion. Although there were a few teachers who happened to have built-in projectors already installed (and an even smaller few who had smart-board projectors) many were in the same boat as Mr. Pellerin. But according to Spang, these projectors were purchased the previous year. The first phase of installation began shortly after the holiday break. Phase one was to give every classroom that did not already have a smart board or an Epson Projector the new interactive technology. Phase two was to install the interactive technology into the existing, non-interactive projectors. By the end of the school year, the technology was up and running in every room of the high school. Ms. Spang has given the teachers basic lessons on how to operate these new projectors. What they choose to do with it is completely up to them.